Fathom Events, New Line Cinema, Metro-Goldwyn-Mayer Pictures and Warner Bros. Pictures will present all three extended editions of The Hobbit Trilogy across a three-night theatrical event, featuring The Hobbit: An Unexpected Journey on Monday, October 5; The Hobbit: The Desolation of Smaug on Wednesday, October 7; and The Hobbit: The Battle of The Five Armies on Tuesday, October 13. Each of the features will play at 7:30 p.m. local time. This is the first time that the extended editions have been shown in movie theaters, including the never-before-seen extended edition of The Hobbit: The Battle of The Five Armies. In addition to the events, there will be a special on-screen introduction from the Trilogy's director, co-screenwriter and producer Peter Jackson. To celebrate this announcement, Warner Bros. Online has released a new trailer for this three-night theatrical event that any fan of The Hobbit trilogy shouldn't miss. We reported yesterday that The Hobbit: The Battle of the Five Armies Extended Edition will be released on Digital HD October 20, before the Blu-ray and DVD debuts November 17. This theatrical event not only gives viewers chance to see the whole trilogy in theaters one last time, but it also gives us our first look at The Hobbit: The Battle of The Five Armies extended edition, which includes 20 minutes of new footage. Tickets for The Hobbit Trilogy are now on sale and can be purchased online by visiting FathomEvents.com, or at participating theater box offices. Fans throughout the U.S. will be able to enjoy the event in more than 500 movie theaters. For a complete list of theater locations visit the Fathom Events website (theaters and participants are subject to change). Here's what Fathom Events CEO John Rubey had to say in a statement about the extended editions of The Hobbit trilogy coming to theaters. "We are excited to give fans the first chance to see the extended editions of this Trilogy in cinemas. The incredible cinematography and action in each feature will be even better on the big screen and will give The Hobbit fans a chance to binge-watch as a community!" In The Hobbit: The Desolation of Smaug, Bilbo Baggins, Gandalf and the Dwarves continue their journey to reclaim the Dwarf Kingdom of Erebor. Along the way they encounter the skin-changer Beorn (Mikael Persbrandt), giant Spiders of Mirkwood, Wood-elves led by Legolas (Orlando Bloom), Tauriel (Evangeline Lilly), and King Thranduil (Lee Pace), and a mysterious Man named Bard (Luke Evans), who smuggles them into Lake-town. Finally reaching the Lonely Mountain, they face their greatest danger - the Dragon Smaug (Benedict Cumberbatch). The Hobbit: The Battle of The Five Armies begins with The Dwarves of Erebor having reclaimed their homeland, but now must face the consequences of having unleashed the terrifying Dragon, Smaug, upon Lake-town. As Thorin sacrifices friendship and honor under the weight of his reclaimed wealth, Bilbo is forced to make a desperate and dangerous choice, not knowing that even greater perils lie ahead-Sauron, the Dark Lord, has returned to Middle-earth. As darkness converges on their escalating conflict, the races of Dwarves, Elves and Men must decide-unite or be destroyed. 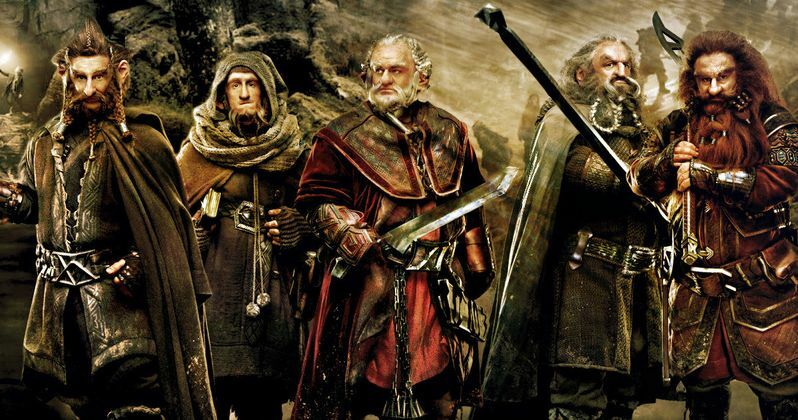 Bilbo finds himself fighting for his life and the lives of his friends as five great armies go to war. Check out the new trailer for The Hobbit Trilogy Extended Editions, and visit FathomEvents.com to buy your tickets today.